We have a lot of sympathy for Milo the Cat here. The idea of waking up from a nap and finding your balls missing is absolutely horrifying. That said, it’s really important to spay and neuter your pets, both to prevent overpopulation and to stave off health problems down the road. 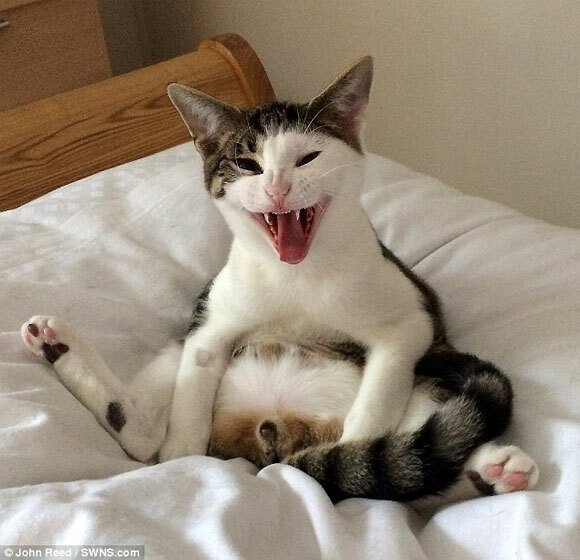 When John Reed, a property developer in the northwest of England, got a new cat named Milo, he knew he needed to get his reproductive organs taken care of. At the age of six months, he took his pet to a vet’s office and had him neutered. Milo was still under the anesthetic when Reed brought him home and laid him on his bed to rest. A little bit later, the cat woke up and Reed had a camera ready to capture the event. The pair of photos he took are hilarious and really speak for themselves. When Milo returned to consciousness, he immediately noticed that something was wrong down there. According to Reed, he was groggy and a little confused, but managed to right himself with his rear legs splayed outwards. It wasn’t ling before the cat realized what had been done to him. When the realization hit, Milo let out an ungodly screech, captured in the second picture. His owner says that the cat sat there for some time, surveying his lost balls and yowling in feline complaint. It was for your own good, buddy, but we doubt you’ll ever be totally convinced.